Gryphon Diablo 300 D/A Converter Module with USB input brings a rare level of comfort, convenience and ease of use to high end audio. By assembling high performance Gryphon digital-to-analogue conversion, preamplification and power amplification on a single chassis, the Gryphon Diablo 300 brings a rare level of comfort, convenience and ease of use to High End audio. Installing an exceptional digital to analogue converter inside an equally ambitious integrated amplifier significantly shortens the signal path, eliminating exterior pre-power interconnects and multiple plugs and soldering points to maintain the integrity and purity of the audio signal. Now, in classic Gryphon style, technologies and components developed for our cost-no-object, state of the art reference models trickle down in our product range. And when it rains at Gryphon, it really trickles down hard. Ready for current and future digital audio formats, the cutting edge ESS Sabre ES9018 DAC chip stands at the heart of the Diablo 300 DAC module, partnered with heavily regulated, fully discrete, ultra-low noise +/- 22VDC voltage supplies to ensure optimal noise suppression and minimal analogue THD. The Diablo 300 DAC module draws no power from any USB source component, generating instead its own pure power for maximum isolation from the PC. This effectively removes one of the weak points in conventional DAC designs: dependence on USB bus power, i.e., 5V fed to the USB receiver from the source computer via the USB cable’s power line which “bleeds” noise and interference into the two data lines with significant audible impact. The 12.5 Farad (!) SuperCap dedicated power supply acts as a stable, isolated, ideal virtual battery, eliminating the computer as a power source altogether for an ultra-low noise floor and unrestricted dynamics. Pure power at this crucial early stage makes a major contribution to the natural, effortless ease that defines the sound of digital by Gryphon. The Gryphon Diablo 300 DAC module adds five high quality digital inputs to the amplifier’s standard complement of five analogue inputs: one gold-plated Swiss Neutric XLR socket for a balanced 110Ω AES source, a single TOSLink optical input, dual gold-plated 75Ω BNC sockets with Teflon insulation for two S/PDIF components and a single USB input. With the DAC module on-board, the Diablo 300 displays the selected digital source, sampling frequency, PCM or DSD audio format, SuperCap power supply status (charging or fully charged) and active digital filter setting. For PCM sources, fast or slow roll-off digital filter settings are available. For DSD sources, choose between 50, 60, 70 kHz (-3dB) bandpass filters. The Diablo 300 DAC module is fully isolated in an independent aluminium housing with grounded panels and is impervious to HF radiation, eliminating any risk of interference with the amplifier stages or the optional Gryphon phono module. 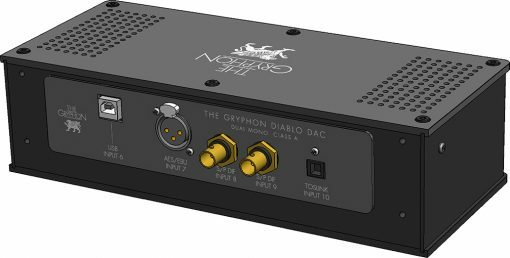 The DAC module for the Gryphon Diablo 300 integrated amplifier can be factory installed or fitted at a later date. Specifications can be changed by Gryphon Audio Designs without further notice.